Ruthiebear (Titusville, NJ, United States) on 27 April 2014 in Landscape & Rural and Portfolio. Happy and cheerful colors. The figure shows well that is spring. Des branches jaunes et d'autre et ce maisons rouges en fond sueprbe. Wonderful image and beautifully processed too. De très belles couleurs...très artistique...bon dimanche ! A beautiful colorful view, the treatment is superb. An excellent photo, I love the light and colors. Superb focus on the detail of the tree - and the wonderful red barns blurs beautifully into the background. Beautiful light and lovely mood! Nice capture! such beautiful comosition, focus, DOF, colors & lighting! Wonderful image of the plant ! Nice framing and treatment. great framing and colours although the i would have had the buildings in Focus and not the trees framing the shot. Fantastic image. Excellent framing using branches. 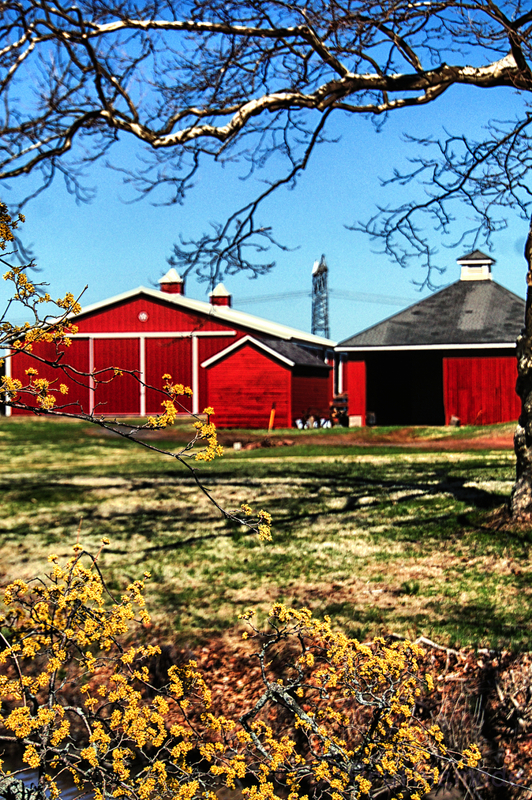 I like the rich red color of the outbuildings and the barn. Nice farm picture. Beautiful framing of the colourful barn and flowers and the tree!!! Beautiful colors and superb composition . I like the way the foreground leads the viewer into the frame while the branch across the top keeps our eyes from wandering too far up. J'apprécie l'ombre portée de l'arbre prête à gagner l'entrée carrée et sombre du bâtiment. Très coloré, un cliché très agréable. Strong, Ruthiebear colors for a brilliant shot! The colours really stand out, Ruthie. That is a very nice farm view. Gorgeous bright colors! I like how you composed this with the yellow blooming tree in the foreground. they are beautiful..., nice shot.. Superb focus and a beautiful shot. Able to see the depth in this image. Good work. A superb frame !! The colors are wonderful against the perfect blue sky !!! Love the barn red color and the scene is beautiful!